A 50 yo female with left side weakness advised Non contrast CT for Brain to rule out any intra cranial bleed or infarction. No bleed or infarct on CT study of Brain. 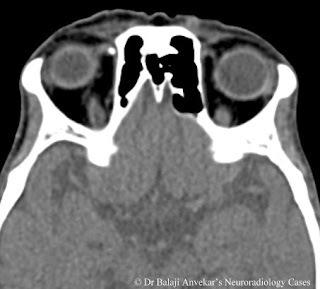 A dense nodular calcification noted in the superior-nasal quadrant of the right orbit. Clinically right eye vision and movement normal. No history of trauma to right eye. Unilateral calcification of trochlear apparatus of right orbit_ noted an incidental finding. Calcification of trochlear apparatus of Obit. Syn: Calcified Trochlea of the Superior Oblique Muscle. The trochlear apparatus of the eye is a cartilaginous structure with a synovium lined sheath that permits unimpeded movement of the superior oblique muscle. It is not clear yet the accurate location of calcification whether its cartilage, the synovial sheath, or the tendon. Hart et al. in his study reported an association between calcification of the trochlear apparatus and DM, reviewed some 159 CT scans of patients and observed trochlear calcifications in 12% of patients with a significant correlation between diabetic patients under 40 years of age and the presence of calcification in the trochlear apparatus. The trochlear calcification on CT is a benign condition may serve as a marker for diabetes in young patients. Trochlear calcifications are observed frequently in persons more than 50 years old. When it is present in patients younger than 40 years, it is strongly associated with diabetes. Another thing which is observed in these studies is trochlear calcifications were more prevalent in male patients and none of the patients in these studies had symptoms related to their trochlear calcification. Studies conducted later, results were In contrast to the findings of Hart et al, did not find a significant correlation between patients under 40 years of age with DM and the presence of trochlear apparatus calcifications. Even there was no increase in trochlear calcifications with advancing age or the presence of systemic disease indicating that trochlear calcifications is not suggestive of a degenerative process and occur regardless of chronic medical disease.